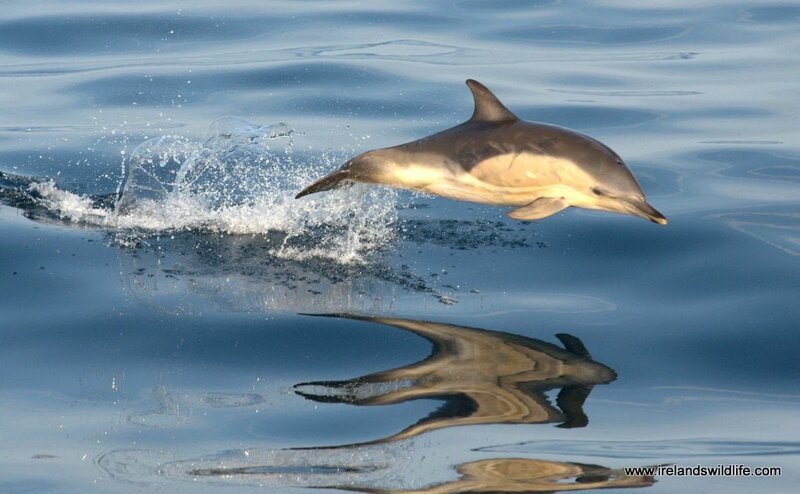 Whales and dolphins are an exciting part of Ireland’s wildlife. As an island nation perched on the edge of the north east Atlantic we have some of the best whalewatching in Europe right on our doorstep. We teamed up with UK optics company Hawke to bring you this in depth feature on how to spot whales and dolphins around the Irish coast, from shore and when you’re out on the water. Close encounters with whales and dolphins are up there on most people’s ultimate wildlife bucket list, but it still surprises many when they hear that Ireland is one of the best places in Europe to see whales and dolphins in the wild. Irish waters were designated as Europe’s first whale and dolphin sanctuary in 1991, and, with the addition of the bowhead whale to the Irish list in 2016, to date 25 species of cetacean have been recorded in Irish territorial waters. On its day whale watching in Ireland can rival anywhere in the world. There are few places on earth where you have the potential to see such a wide range of cetacean species on a single whale watching trip. Harbour porpoise, common dolphin, bottlenose dolphin, minke whale, fin whale and humpback whale occur regularly off Irish coasts, along with an outside chance of Risso’s dolphin and occasionally killer whales. People tend to assume that if you want to go whale watching you have to go out on a boat. That simply isn’t true. Once you know what to look for you’ll be surprised just how much cetacean activity you can detect from land based vantage points. All you need is reasonable optics (binoculars and / or a spotting scope), and the “three Ps” that apply to all wildlife watching: practice, patience and perseverance. 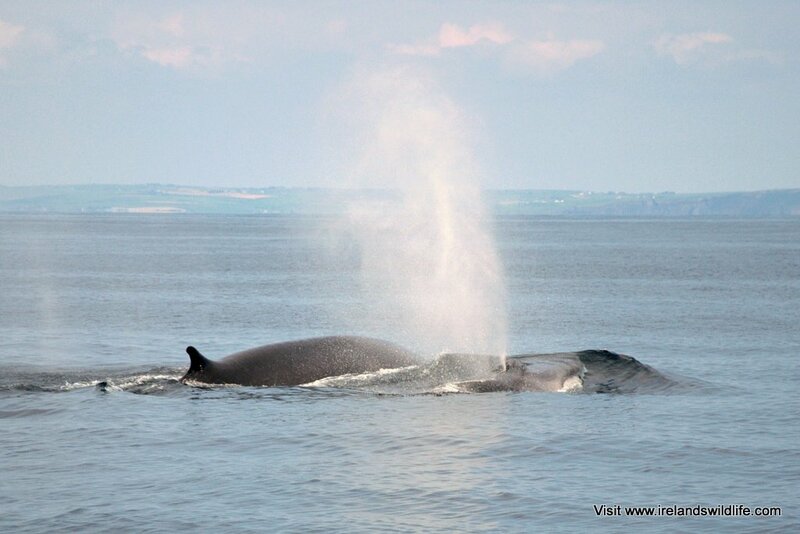 Ireland is an ideal location for shore based whale watching. Our rugged coastline with its countless promontories jutting into the ocean provides plenty of suitable vantage points, and as a small island nation it doesn’t matter where you are in Ireland you’re never very far from the coast. 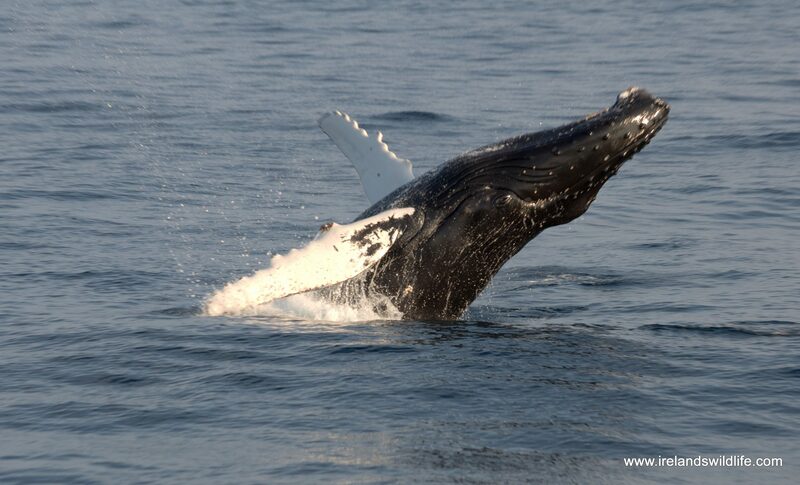 Shore based whale watching is a great way to hone your observation skills. When you see dolphins or whales it’s an incredibly rewarding experience, and even when you don’t the anticipation of what you could potentially see can be intoxicating. Add to that the fact that your shore based sightings contribute to a valuable and growing body of data that helps inform whale and dolphin conservation, and that it has zero-impact on the animals, and shore-based whale watching becomes even more appealing. You can see whales and dolphins from shore in Ireland all year round. There’s always the potential to see something amazing breaking the surface. That said, with the exception of the resident bottlenose dolphins in and around the Shannon estuary, and solitary bottlenose dolphins like Fungi in Co. Kerry and Dusty off the coast of Co. Clare, there are seasonal fluctuations in abundance that affect the likelihood of seeing different species at different locations around the Irish coast. From spring through early summer the majority of sightings in Irish coastal waters are of minke whales, harbour porpoise and small groups of common dolphins. This is also the peak time for basking shark sightings (see our guide to watching basking sharks), and other unusual visitors like the bizarre looking sunfish (Mola mola) and large turtles like the rare leatherback turtle. In recent years humpback whale sightings in spring and summer have been on the increase, particularly off the south coast. As we head from late summer into autumn we start to enter what seasoned whale watchers refer to as “big whale season”. 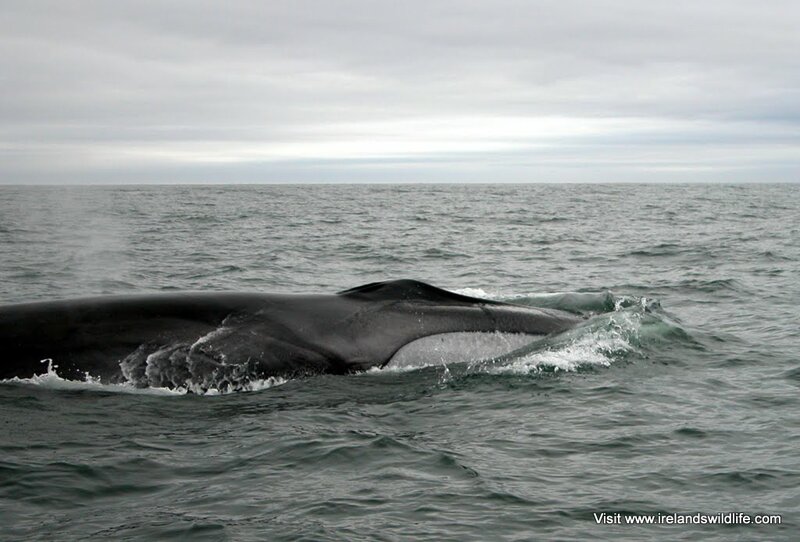 From late July onwards fin whales begin to appear off the south east coast, and typically move south and west following the large shoals of small fish they feed on as the season progresses. Seeing these huge animals (the second largest on earth) lunge-feeding is one of the most impressive sights in nature, and its happening every year just off the Irish coast. Harbour porpoise remain common during the autumn and winter season, and are often seen close to shore, while common dolphins tend to aggregate in ever larger numbers and spend more time closer to shore. It’s not uncommon to encounter huge pods of hundreds, even thousands of dolphins during this season. Regardless of season the best days for spotting whales and dolphins are calm, clear days with little or no swell and excellent visibility. Ideal conditions can be scarce enough around the Irish coast, but you can whale-watch successfully in a variety of conditions as long as the sea isn’t too rough. Check the weather forecast carefully. The key things you need are good visibility, and low winds, which should equate to calm seas with little swell and no whitecaps. 9. high waves. Seas roll. Dense foam streaks. Spray reduces view. Realistically to have a good chance of spotting whales and dolphins from shore you need a sea states of 0 to 2. Sea states 3-4 are much more challenging and decrease your chances of seeing whales and dolphins significantly — not because the animals aren’t there, but because picking them out amongst the waves becomes exponentially more difficult. Any sea state above four makes it extremely difficult to see cetaceans from shore. When it comes to looking for whales and dolphins the only real prerequisite is that you can see the open sea. Anywhere along our coast can provide opportunities to see whales and dolphins in the wild. That said, the south coast has earned a reputation over the years as Ireland’s whale watching hotspot, particularly when it comes to large species like fin whales and humpbacks. Vantage points from Co. Waterford down through Co. Cork and Co. Kerry an into Co. Clare all have fantastic potential for whale watching. Naturally the nearer the water you are, and the more water you can see from your vantage point, the greater your chances of picking up surfacing whales and dolphins. That makes coastal headlands and promontories ideal. They jut out into the ocean offering panoramic views, and are usually elevated, which means you can see further out to the horizon. While it is possible to spot whales and dolphins from shore with the naked eye, you improve your odds significantly with good optics (binoculars and / or a spotting scope). We don’t have the scope to go into details on choosing good wildlife watching optics in this article, but you’ll find plenty of advice on selecting the right binoculars in our binocular guide here on the site. 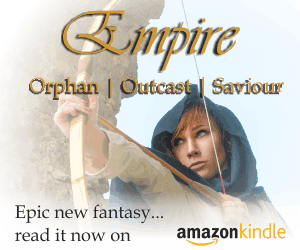 If you prefer you can also get an e-book version on Amazon. Bear in mind that it’s always worth investing in the best pair of binoculars you can afford. Good binoculars will boost your enjoyment not just of whale watching, but of all your wildlife watching immeasurably. You can see binocular we’ve reviewed here. Spotting scopes are great for giving you more reach than binoculars, and are ideal for looking across large expanses of water. However, they tend to be more expensive at a given quality level than binoculars, are much less portable and are useful in a fairly discrete set of circumstances. That said, if you get into whale watching a scope is a very worthwhile investment. A high quality spotting scope is perfect for systematic scanning of a large body of water, and will help you pick out animals you’d miss with the naked eye and even with your binoculars. Of course the extra magnification available from a good spotting scope also means that when you do see whales and dolphins you can enjoy much closer views of them. 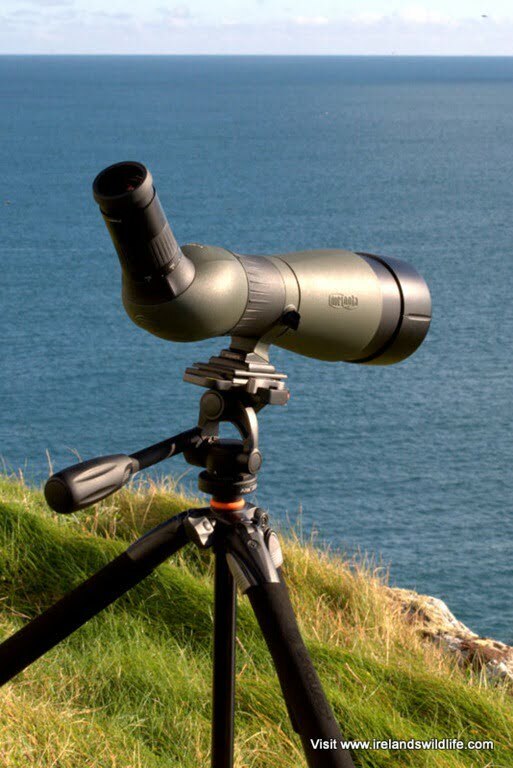 You can browse our spotting scope reviews here. To cover a large expanse of water efficiently it’s best to work systematically. First scan the general area for obvious signs of cetacean activity. Then start at one end of the horizon, and work your way slowly from one side to the other. Cover each sector of the water in turn with your scope or binoculars. Then work your way back again, this time scanning slightly closer to shore. Repeat the process until you’ve covered the entire body of water in front of you. Periodically raise your eyes from your optics and scan across the expanse of water quickly with the naked eye to make sure you’re not missing obvious activity outside the limited field of view of your optics. When you notice something that looks a little out of the ordinary, stop and keep watching that area for a few minutes… if the disturbance was caused by a surfacing cetacean there’s a good chance it will surface again in the same area soon afterwards (bear in mind that if it’s a deep dive some species can stay submerged for 8-12 minutes at a time). Aggregations of feeding seabirds are often indicators of cetacean activity. Splashes, ripples or disturbances in the water that are “different” to the normal pattern of the waves and wind could indicate activity on or just under the surface. Look out for anything out of the ordinary as you scan. If it’s a sunny day you may also see a flash or glint as the sun reflects off the smooth, wet back of a surfacing whale or dolphin. 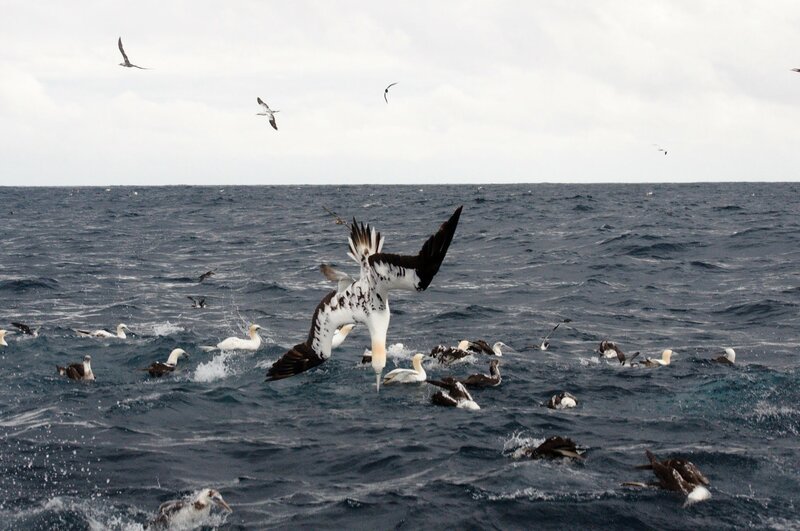 Pay particularly close attention to aggregations of feeding seabirds: diving gannets and wheeling flocks of shearwaters often associate with feeding cetaceans. Groups of auks (razorbills and guillemots) sitting on the water’s surface and diving regularly can also provide a clue. Feeding auks drive small shoaling fish into dense “baitballs” that can attract the attention of passing cetaceans. With larger whales (humpbacks, and especially fin whales) often the first thing you see is a distinct vapour plume as the whale exhales at the surface. This is caused by a combination of condensing water vapour from the whale’s exhaled breath, and the vaporisation of water sitting around the animal’s blowhole as it exhales forcefully. Fin whales have the most obvious blow. They eject a vertical plume of water vapour that erupts up to seven metres into the air. Fin whale blows can be visible all the way out to the horizon on a clear day, and can appear to “hang” in the air for some time. Humpback whales have a much shorter, more “bushy” blow that isn’t as noticeable, but can still be quite obvious on calm, clear days. Minke whales — our most commonly observed baleen whale — rarely emit a visible blow. As mentioned above the three Ps of wildlife watching come into play as much with whale watching as as they do with other types of wildlife watching — perhaps more so. You will spend long hours watching a seemingly empty sea. At first you will be distracted by every stray ripple and errant wave, convinced there’s an elusive cetacean just beneath the surface. But in time you’ll learn to recognise the false positives for what they are, will get better at reading the subtle cues and will start to see more cetaceans. So don’t get disheartened — stay at it and you’ll soon reap dividends. Heading out across Rosscarbery bay aboard Cork Whale Watch vessel, The Holly Jo, on one of our Discover Wildlife Experiences. While whale watching from shore has many benefits, and has no impact on the animals, for unforgettable close encounters with these iconic marine mammals there’s no substitute for heading out to sea on a boat. It’s important to remember that as soon as you venture out on the water there’s potential to have significant negative impact on cetaceans. Always put the welfare of the animals first. The proximity of whales, dolphins and porpoise to the shore here in Ireland means that its entirely possible to encounter a variety species whilst out on the water in your own craft — be that a kayak or paddle-board, a sailing dingy, a motor cruiser, a sailing yacht or other recreational craft. While it’s exciting and exhilarating to see whales and dolphins at sea, it’s imperative that during such encounters you always put the animal’s first. While there is no universally accepted code of practice for whale watching, following sensible guidelines will ensure you can enjoy your encounter while minimising impact on the animals. In 2005 the The Department of Communications, Marine and Natural Resources (now under the auspices of Transport, Tourism and Sport) issued Marine Notice 15 of 2005 (click the link to open as a PDF). The notice was drafted in consultation with the IWDG, and lays down official Irish Government guidelines for correct procedures when encountering whales and dolphins in Irish waters. Always allow dolphins approach a boat rather than attempt to go after them. Special care must be taken when young calves are seen – do not come between a mother and her calf. Commercial whale watching operations are slowly becoming more common around Ireland as people realise just how good the whalewatching can be and demand grows. 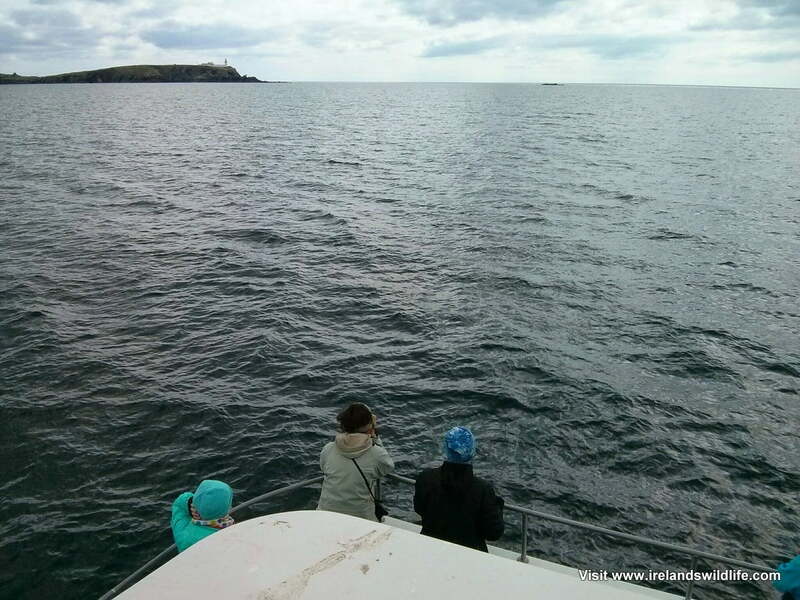 Many charter angling operations now offer whale watching tours in season, but by far the best way of getting good views of whales and dolphins off the Irish coast is to go out with an experienced and reputable dedicated whale watch operator. The best operators have decades of experience finding and watching whales off the Irish coast, and they harness that experience and expertise to improve your chances of a memorable whale and / or dolphin encounter. 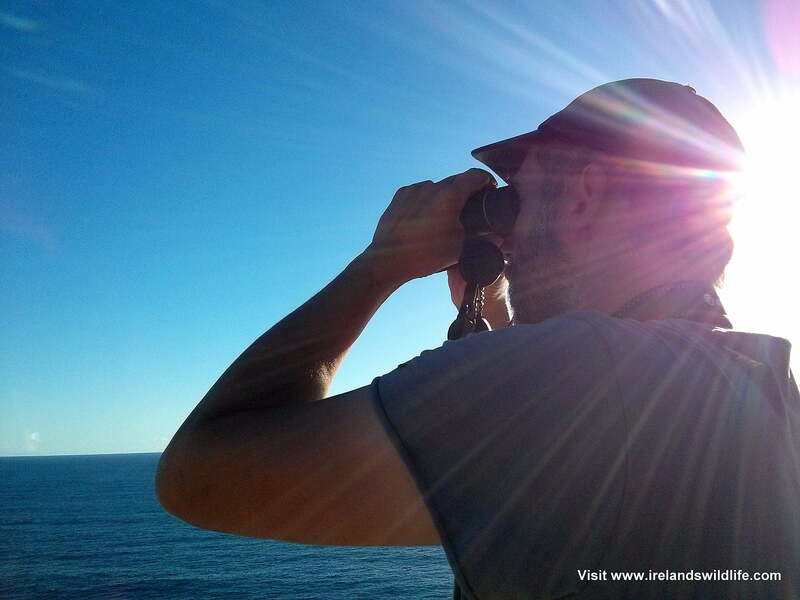 There are numerous reputable dedicated whale watching operators around the Irish coast. Ask around locally, check local tourist information or search online for an operator near you. 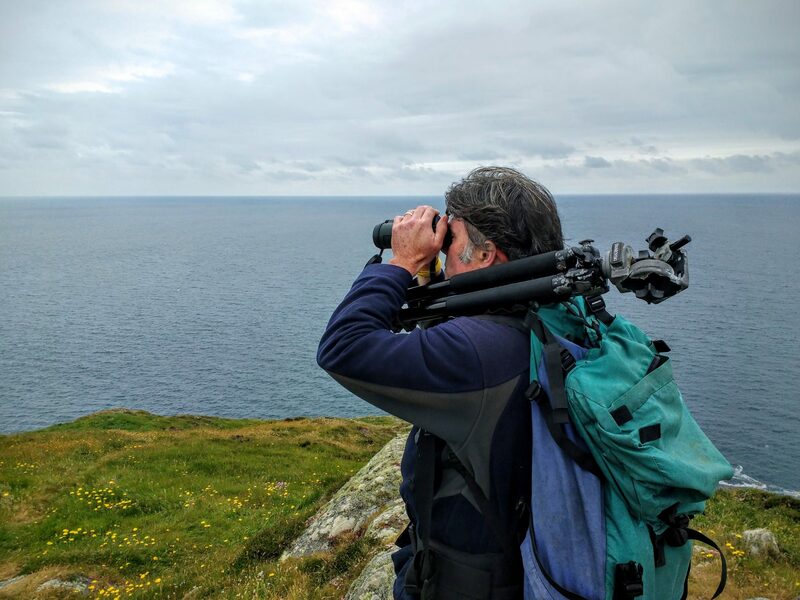 If you’re looking for a personal recommendation, we use Ireland’s longest established whale watch operator, Colin Barnes of Cork Whale Watch, for all of the whale watching elements on our Ireland’s Wildlife Tours and Discover Wildlife Experiences. I wholeheartedly recommend Colin for whale watching off the West Cork coast. Looking for whales and dolphins from the Cherbourg-Rosslare ferry. If you’re using a ferry between Ireland and the UK or Continental Europe it’s well worth looking out for porpoises, dolphins and whales during the crossing.. Commercial ferries offer an excellent stable whale watching platform — with the obvious caveat that they are not going to stop or deviate their course so you can get a better look at any cetaceans you see. When you’re whale watching from a boat your looking for many of the same signs as when you’re whale watching from shore. The big difference is that at sea level on a boat you’re not seeing anywhere near as much water — but anything you do see is likely to be a lot closer. 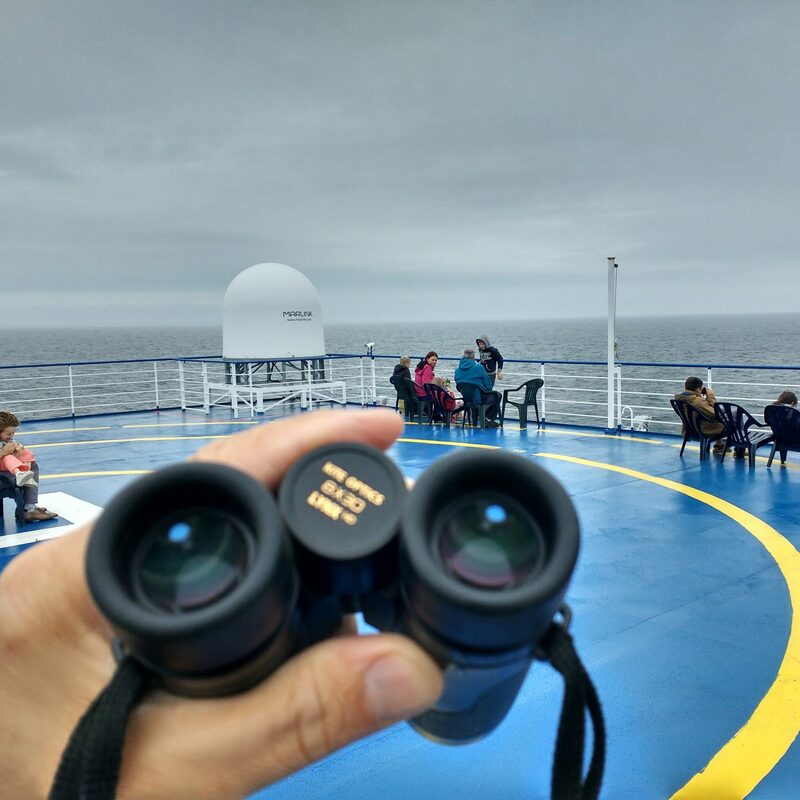 While binoculars can be useful to check for cetacean activity under distant flocks of feeding birds, on a boat you’ll usually find it more effective to scan with the naked eye. Using optics in anything but the calmest of seas on a small boat can be frustrating (commercial ferries with stabilisers are obviously different). If you’re on a whale watching boat and see signs of cetacean activity let the skipper or a member of the crew know so that they can check it out. There are plenty of resources available online and in print to help you identify the whales and dolphins you see while whale watching. 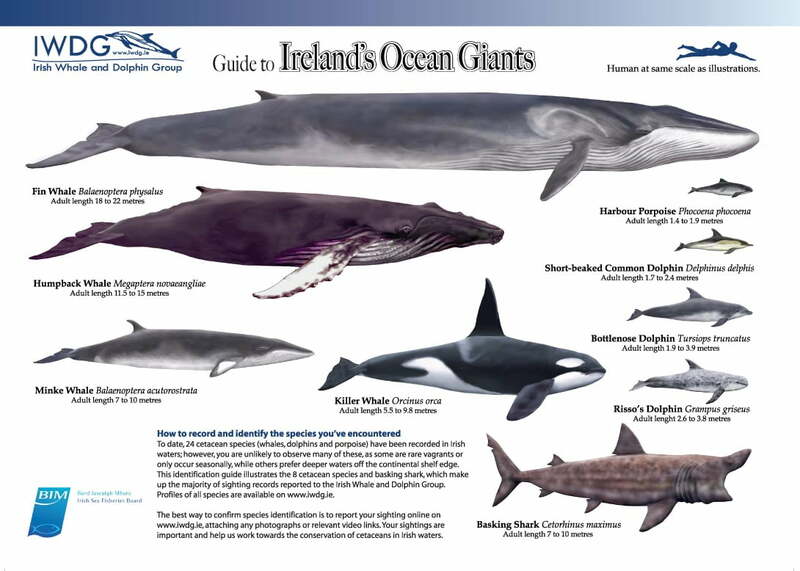 One of the handiest is this Guide to Ireland’s Ocean Giants produced by the IWDG. 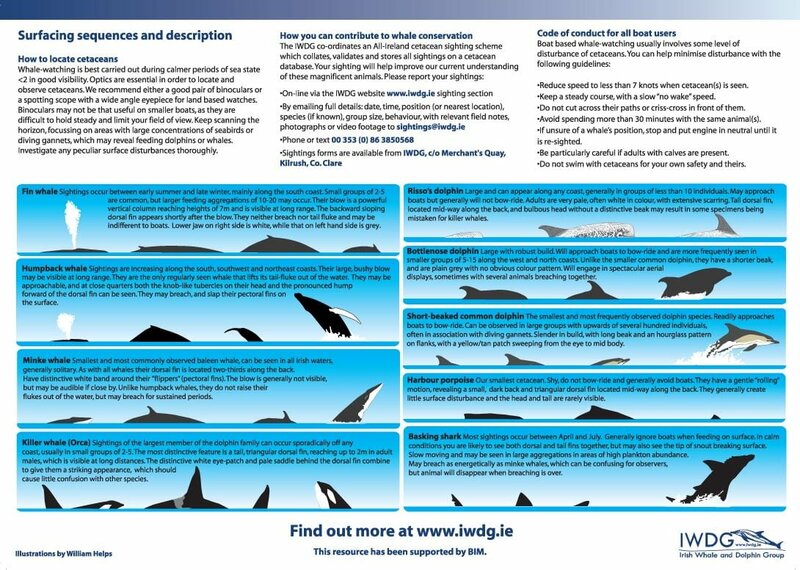 This single-sheet resource is brilliant as a quick reference on a headland or out on a boat to help you pick out the most frequently seen species around the Irish coast. As well as the fabulous illustrations on the front by wildlife artist William Helps, the reverse of the splash-proof sheet gives details of the typical surfacing sequences and behaviour for the most commonly seen species. It’s available to buy direct from the IWDG. Other useful field guides include A Guide to the Identification of the Whales & Dolphins of Ireland by Jim Wilson and Simon Berrow, Whale Watching in Britain and Europe by Mark Carwardine, and Whales, Dolphins and Seals, a field guide to the marine mammals of the world by Hadoram Shirihai and Brett Jarrett. If you’re interested in watching whales and dolphins then you’re probably interested in their conservation and well being. The good news is that by watching these animals, and recording your sightings through the IWDG’s online sightings scheme, you can actively contribute to the body of data that informs conservation decisions in Ireland and further affield. 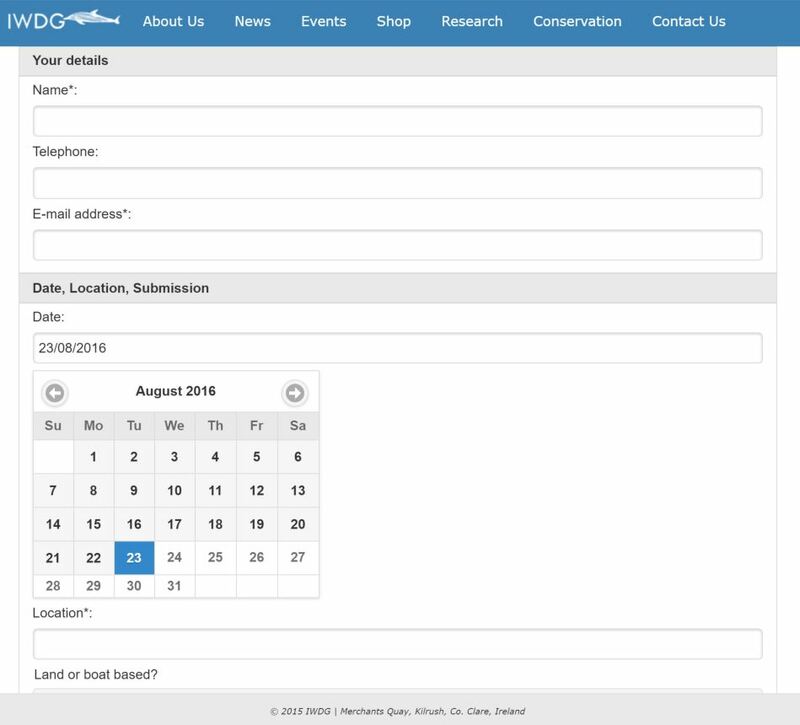 Recording your sightings is easy using the IWDG’s dedicated online cetacean sightings form — simply fill in the information and submit the online form. Your sightings will be validated (the IWDG sightings coordinator may contact you for more detail if necessary), and entered into the sightings database. The collective sightings data is invaluable for research and conservation. The IWDG is an Irish NGO dedicated to the conservation and better understanding of cetaceans (whales, dolphins and porpoises) in Irish waters. The Group was founded in 1990 to establish an Irish stranding and sighting scheme, and to campaign for the declaration of Irish territorial waters as a whale and dolphin sanctuary. Just six months later in June 1991 the Irish Government declared all Irish waters to be the first whale and dolphin sanctuary in Europe. Reduced rates on IWDG publications: sighting reviews, posters etc. 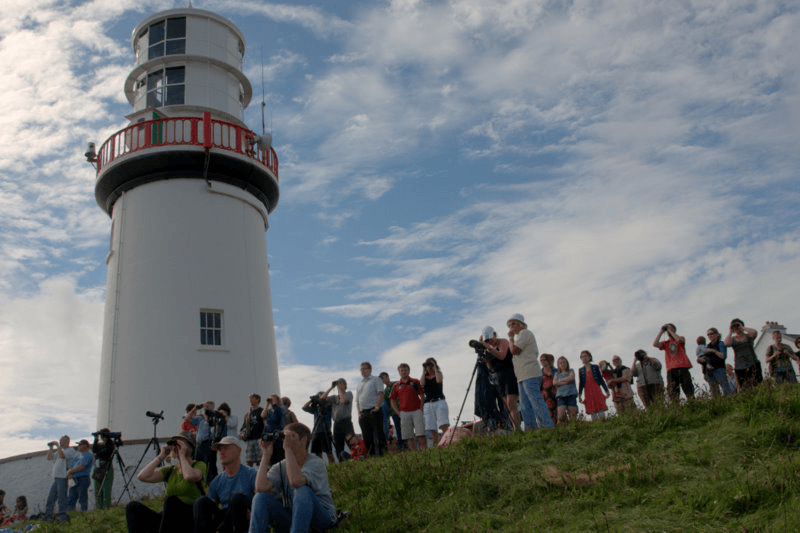 Every year the Irish Whale and Dolphin Group hosts an all-Ireland shore base whale watching event called Whale Watch Ireland. The coordinated event happens at 20 headlands around the island of Ireland, so there’s bound to be one within striking distance wherever you are on the island. The event helps to raise awareness of whales and dolphins in Ireland, and give you a chance to give whale watching a try with advice and tips from experienced whale watchers and IWDG personnel. 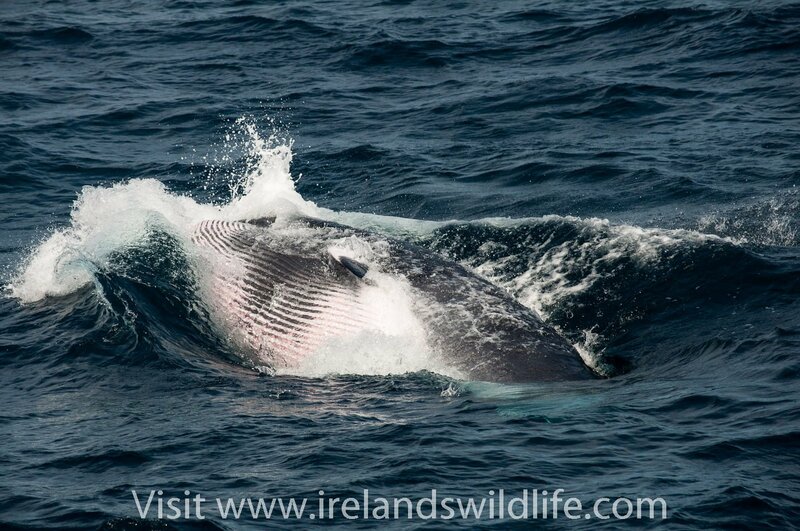 Whale Watch Ireland usually takes place on the third Saturday in August — for full details see the IWDG events page. 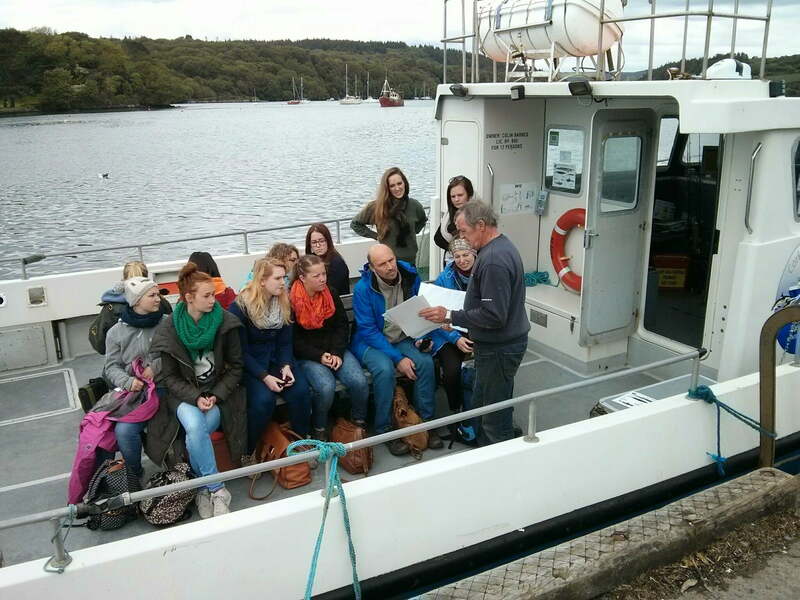 Our Ireland’s Wildlife Tours and Discover Wildlife Exeriences based on the West Cork coast usually include shore-based and boat-based whale watching — check out our range of Tours and Experiences through the above links, or get in touch to find out more. This quality wildlife and nature content is brought to you in association with Hawke Optics, who produce a range of affordable high-quality binoculars and spotting scopes perfect for birding and wildlife observation. Check out our reviews of Hawke Optics on Ireland’s Wildlife. Saw a plume while on the Oscar Wilde ferry on 21 June a few hours off Rosslare. Great sight to see.